I am a teacher and university professor. I began my professional career at the age of 18 with a class of 36 grade 4 and 5 students from a poor neighbourhood on the edge of the Fraser River in Surrey, British Columbia. I loved teaching children, and for a long time could not imagine doing anything else. 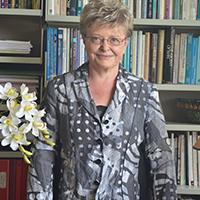 There were other interests and careers to explore, however, and these led me to doctoral studies in cell biology, a masters degree in science education, and faculty positions at St. Thomas University in Fredericton, at the University of Alberta in Edmonton, and, eventually, at the Faculty of Education here at Western. As a sessional lecturer, I taught Biology in the Department of Zoology at UBC for a year, and science education in the Faculty of Education there. In other times and places, I have taught general teaching methods, curriculum studies, and curriculum and instruction in language arts, maths, and science. I worked with student teachers in rural New Brunswick, Fredericton, and St. John, and in urban and suburban schools in Edmonton. I spent a term with the University of Alberta's Morning Star native teacher education program, living and working at Blue Quills school near St. Paul, Alberta. While doing biological research at UBC, I read the history, philosophy, and sociology of science, and began to form my ideas about the nature of science. At Western Washington, I studied and critiqued all the best science curricula of the day, and began to struggle with different conceptions of curriculum. I was particularly attracted to the writings of the so-called reconceptualist school, but found much of value in other orientations as well. At the University of Alberta, Max van Manen introduced me to phenomenology, hermeneutics, and the world of qualitative research methods, and Ted Aoki introduced me to critical theory and humanistic ways of thinking about curriculum and curriculum evaluation. I bring all this background to my teaching and research here at Western. As a member of a faculty of education, my research interests have ranged widely over topics in teacher education and teacher development, the practicum, science education, and curriculum. I have researched and evaluated the practicum program, worked with local school districts on the development of an induction program for beginning teachers and support programs for associate teachers, studied issues concerning male elementary school teachers, written about power relationships between student teachers and associate teachers in the practicum, and considered the possibility of developing a "vision" of education in Teacher Candidates through mentoring by their associate teachers. As a member of a scholarly community and a person ever more conscious of the importance of history in our lives, I have researched aspects of the story of the so-called "home children" who were emigrated to Canada from Britain in the late 19th and early 20th centuries. I have researched the life and work of William Quarrier, who emigrated 7000 children to Canada from his homes for orphaned and destitute children in Scotland, and written about how Canadian home children were depicted over the last century in photographs. McNay, M. (2009). Western Guide to Curriculum Review. London, ON: The University of Western Ontario Centre for Teaching and Learning. McNay, M. (2009). "Immigrants, labourers, 'others': Canada's Home Children," in L. Lerner (Ed. ), Depicting Canada's Children. Waterloo, Ontario: Wilfrid Laurier University Press. McNay, M. (2003). The need to explore: Non-experimental science fair projects. In Science Fairs Plus: Reinventing an Old Favorite, K-8, pp. 54-56. Washington, D.C.: NSTA Press.